Cyclone Idai, which made landfall in eastern Mozambique on March 14, is the worst natural disaster to hit southern Africa in two decades. The cyclone damaged critical infrastructure, destroyed as much as 50 percent of Mozambique’s annual crops, and killed more than 500 people. Communities affected by flooding are now also being struck by a rapidly growing cholera outbreak. Approximately 1.85 million Mozambicans, including 1 million children, need urgent humanitarian assistance to recover from the disaster. In order to support the humanitarian response to Idai, GeoPoll deployed a remote, SMS-based survey to gather on-the-ground data on infrastructure damages, food security, and the aid needed most by communities. Analysis of the GeoPoll data shows the multidimensional effect of the cyclone. As shown in Figure 1, respondents who report major damages to their houses are more likely to also lack access to electricity and drinking water than respondents who report minor or no damages. Among those who report major damages, nearly 75 percent do not have access to drinking water or electricity, while among those with minor damages, 33 percent lack access to electricity and 42 percent lack access to drinking water. These figures highlight the need for humanitarian aid to be targeted toward those areas hit most severely by the cyclone, as people in these areas are likely to have multiple, overlapping needs. Source: Figure produced by author using GeoPoll data. The GeoPoll survey also suggests that humanitarian aid may not currently be reaching those Mozambicans most in need. 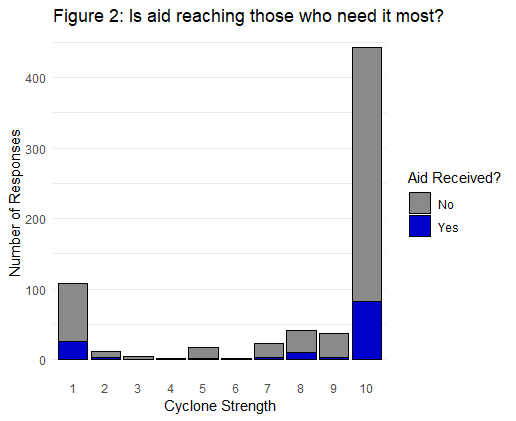 Figure 2 shows that among those who identified the impact of the cyclone as most severe—over 400 respondents—only around one-fifth have received aid. In contrast, around 25 percent of those who identified the cyclone’s strength to be least severe have received aid. As roads may be impassable in areas where the cyclone strength was highest, it is vital that humanitarian aid providers explore a variety of methods to deliver aid to difficult-to-access, high-need areas. Figure 2: Is aid reaching those who need it most? There is also need for further survey data collection to improve the coordination of the humanitarian response to Idai. As the map below shows, GeoPoll received relatively few survey responses outside of the three major cities Beira, Chimoio, and Quelimane. Further rounds of surveying by GeoPoll and other organizations, which can be supplemented with additional data from satellite imagery, will help resolve this problem and continue improving the effectiveness of the humanitarian response.